This is an extended version of my recent article A rough guide to annual energy production estimations for wind energy investors published in the Resource Global Network Magazine in August 2017. If you are involved in acquiring or investing in wind energy projects, it is crucial for you to estimate the Annual Energy Production (AEP) as accurately as possible in your business case – independently of the seller. The AEP is a key factor in the calculation of your Internal Rate of Return (IRR) - and inaccuracies on the order of 20% in AEP can make the difference between a respectable project IRR of 7% and an infeasible IRR of only 3% (see the example from TetraTech below). Furthermore, it is important for you to be able to quantify the uncertainties in the AEP estimation in order to understand the associated investment risks. The aim of this article is explain how AEP estimations are carried out for wind energy projects in order to help investors to establish the most accurate values of AEP and associated uncertainties for their business case. Before reading the rest of this article, make sure you have made yourself familiar with the terms used by reading this article. The project lifecycle of wind energy projects can be generally divided up into the phases shown below, depending on the exact regulations of the country in which the project is being developed. The AEP is estimated roughly by the project developer in the pre-feasibility phase, but the final estimation used for the project financing is carried out in the Wind Resource Assessment (WRA) phase, marked above in white. As the WRA is a key driver for the project financing, it must be carried out according to certain standards and guidelines in order for it to be accepted by a finance institution, making it “bankable”. It is standard practice to for the planner to carry out three independent WRAs from external accredited companies. Investors need to be capable of choosing reasonable values for the estimated AEP and uncertainty of a project. Deciding upon these values requires a careful internal evaluation of the available information, which requires a detailed understanding of the procedure. There are different types of WRAs that can be carried out, depending on the required accuracy and on the available information. For simplicity, I have split these types into three main levels, shown below. Level 1 and 2 are both preliminary-level studies, which are not accurate enough to bankable. In Level 1, publicly available wind data from sources such as weather stations and airports are used together with a publicly available high-level planning tool such as RetScreen. The resulting AEP estimation as an accuracy of about ±50%. In Level 2, the elevation contours and terrain are taken into account and the wind field and wakes are modelled with a tool such as WAsP, WindPRO or WindFarmer. The accuracy of the energy estimation is about ±30%. 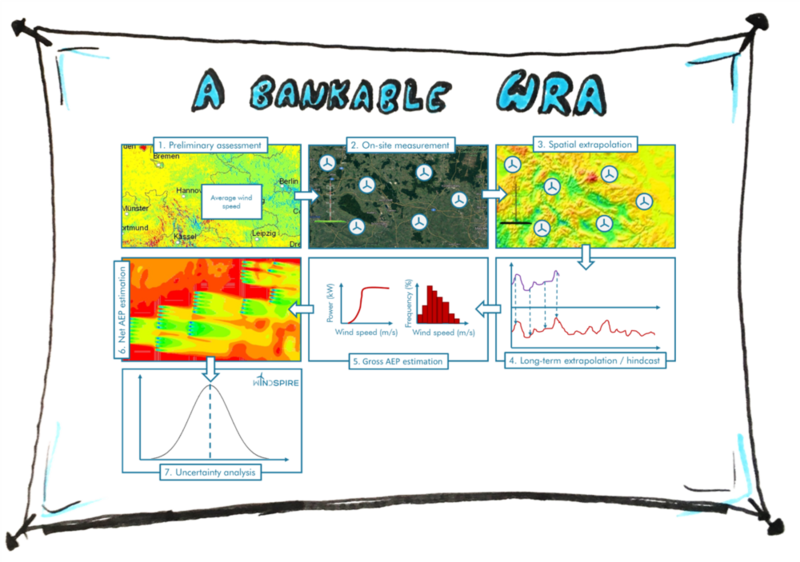 A Level 3 WRA is carried out using onsite wind measurements combined with a tool for wind field and wakes modelling with a tool such as WAsP, WindPRO or WindFarmer. Under certain circumstances, this can reach the requirements for a bankable WRA, and can have an accuracy of up to ±10%. IEC 61400-12-1: standard for wind measurements. MEASNET “Evaluation of site-specific wind conditions”: guideline for site assessment process with focus on data quality, plausibility and integrity. FGW TR6: technical guideline for the processes for determining the wind potential and energy yield at wind turbine sites (mainly applied in Germany). Each of these steps is described in more detail below. This step is the equivalent to Level 1 and 2 WRAs as explained above. It begins with high-level analysis of wind-rich areas either directly using publicly available data or by applying high-level wind data based on numerical weather prediction mesoscale models such as that from 3Tier and AWS Truepower. A recent review of available models can be found here. *Watch out for: the accuracy of a preliminary assessment can be as low as ±50%, potentially making the difference between an IRR of 5% and -2%. The on-site wind measurement is usually done with a met mast equipped with anemometers and wind vanes or with remote sensing devices such as a LiDAR. It is a key part of the WRA, as wind turbine power is highly sensitive to the wind speed (proportional to the wind speed cubed). In order for a wind measurement to be bankable, it must be carried out according to the international standard IEC 61400-12-1. This includes requirements regarding the mounting of the measurement devices, the height and number of measurements, the measurement time and frequency, the measurement accuracy as well as the methods for data filtering and analysis. For example, the highest wind speed measurement has to be at a height of least 2/3 of the hub height, the measurement frequency 1 Hz and the time period at least one year. The results of the on-site wind measurements are usually presented in terms of the wind speed frequency distribution, the wind rose, the wind shear and the turbulence characteristics as shown below. *Watch out for: for projects in Germany, in some cases it may not be necessary to carry out an on-site wind measurements (according to FGW TR6). Instead, the energy yield data from nearby wind turbines can be used (within 10 km for flat terrain and 2 km for complex terrain). This step involves extrapolating the measured wind data from the few point measurements at the location of the measurement device to the entire volume under consideration. When I say volume, I mean the area that you see on the map at a range of different heights, forming a 3-dimensional volume. This is necessary because different wind turbines are not only installed at different geographical locations, they may have different hub heights. The three most important types of spatial extrapolation are shown below. If the terrain is fairly flat, the wind follows the contours of the terrain nicely, and the flow can be approximated through linear models. In these linear models, the changes in wind speed due to the changes in slope are computed using a simple, linear relationship between pressure and wind speed (more information about this here). There are a number of tools used in the industry for carrying out this extrapolation process, such as WAsP, WindPro and WindFarmer. These tools can be used fairly easily by a non-expert after carrying out an introductory course. As soon as the terrain is steeper than about 17 degrees (3:10) the flow is likely to separate, which means it isn’t able to nicely follow the terrain contours anymore, but it becomes very chaotic and mixed up, as shown in the picture in the middle of Figure 5. This means that linear models can no longer be applied reliably and instead Computational Fluid Dynamics (CFD) has to be used. This involves dividing the flow region into millions of little cells, in each of which the Reynolds-Averaged Navier Stokes equations have to be (attempted to be) solved. CFD is a very powerful technique used for every imaginable application to model fluid flow around or through objects. You can find an introduction to CFD here. CFD should never be carried out by non-experts as it is generally very complicated to use and the assumptions made have to be fully understood, otherwise the results can be completely meaningless (in which case it can be referred to Colourful Fluid Dynamics). There are a number of commercial packages available for carrying out CFD simulations, such as STAR-CD, ANSYS CFD and ANSYS Fluent, as well as the open-source software OpenFOAM. Many companies and research groups develop their own software specific for their required application. For wind energy applications, software such as WindSIM and WAsP-CFD is available, but should be applied with great care. The linear wind models are only able to extrapolate within two-dimensional layers parallel to the earth’s surface. In order to extrapolate to different heights, however, the commercially available software also contains a model of the change of wind speed with height. This can either be done by fitting a power law or log-law model to the met mast data or, for even more accuracy, by complementing the met mast measurements with a remote sensing device such as a LiDAR, allowing up to about 10 measurements at different heights. *Watch out for: The usage of Computational Fluid Dynamics packages should be examined in detail by an expert. Also, be careful assessing WRAs in which remote sensing have not been used to measure the wind profile with height across the entire rotor area. As the wind measurements usually take place for 1-3 years but a wind energy project is installed for at least 20 years, the expected changes in wind speed over the next 20 years need to be taken into consideration in the AEP estimation. This is done by comparing the measured wind speed to a long-range reference using the Measure-Correlate-Predict (MCP) method. The three steps of this method are shown below. The underlying assumption for this method is that a stable long-term mean value of the wind conditions exist and can be derived from historic data. This value is then used as a best estimate for future wind conditions. There are some studies (here, here and here) suggesting this isn’t the case, however, and this topic should be observed carefully over the next couple of years. Common long-range reference data sources are reanalysis or mesoscale numerical weather prediction data for the past 30 years, which are provided by organisation such as DTU and EMD in Denmark, AWS Truepower and 3Tier in the USA as well as Sander & Partner in Germany. This data is based on long-term high-quality data sets at heights of at least 50 m above ground level, mainly taken from national weather stations and airport data and extrapolated spatially. The quality of these data is much lower in developing countries, where this measurement data is not available. Other long-term scaling methods include the Wind Index or Energy Index Method and the Distribution Scaling Method. The Wind Index Method involves deriving an index value from the reference data, which represents the wind speed or energy yield variation at the site with sufficient quality. The Distribution Scaling Method involves applying the long-term scaling methods to the parameters of the wind speed frequency distribution in each wind direction sector. *Watch out for: The long-term extrapolation method used will be based on the country you are in and the date that is available. Make sure to always check that the chosen method is validated and check this with an expert. The gross AEP can be calculated directly from the extrapolated wind speed distribution at hub height at each planned wind turbine position, from the hub height air density and from the wind turbine power curve. Power curves are delivered by the manufacturer and can either be calculated for different air densities or measured by an independent accredited institution according to IEC 61400-12-1. If the power curve is not available for the air density at the site, it must be corrected according to IEC 61400-12-1. More about the method for the calculation of gross AEP can be found here. *Watch out for: Don’t forget to check the source of the power curve and adapt your uncertainty analysis accordingly. Make sure that the power curve is corrected for the hub height air density. Wake losses: can be modelled using a software such as WaSP, WindPRO and WindFarmer. The reduction in wind speed and increase in turbulence intensity behind the wind turbine is calculated using an engineering model based on the thrust factor of the wind turbine (provided by the manufacturer) and the separation distance. These engineering models are slightly different depending on the software used and is a constant topic of further research and development. Availability: due to the wind turbine not being available to produce power due to several reasons such as planned and unplanned maintenance. Read more about this here. Turbine performance losses: occur due to the wind turbine not performing ideally and due to wind conditions different to those at the reference site at which the power curve was measured. Electrical losses: due to wiring, transformers, substation and transmission within the wind turbine. Environmental losses: for example due to blade erosion over time or icing. Curtailments: losses due to forced shut-downs to protect the grid or to reduce noise and shadow impacts. *Watch out for: The losses must be very carefully assessed for each project. Be careful to check that the wake-loss model is state-of-the-art as improved models are becoming available. The uncertainty analysis must be carried out according to the “Guide to expression of uncertainty in measurement” (GUM). This involves estimating or measuring every single uncertainty from each step of the WRA and combining them to a total uncertainty. This potentially results in a fairly high inaccuracy in the AEP estimation of the order of 10-20%, depending on the country the project is in, the data available and amount of money invested. As mentioned right at the beginning, these uncertainties can have a large effect on the project success. Therefore they are taken into account for in the WRA by using exceedance probabilities. The calculated AEP represents the most likely result, considering the uncertainties involved at each step and assuming that they follow a normal distribution. This value is known as “P50”, because the probability of exceeding it is 50%, as can be seen below (left and middle). In the financing of a wind farm, the values of P75 and P90 are also used; P90, for example, is then the value which has a 90% chance of being exceeded. The two plots show two examples of different uncertainty distributions; in the left-hand plot, the uncertainty is lower than the middle plot. You can see that a lower uncertainty results in a higher (and more certain) value of P90. Thus if the project planner can reduce the uncertainty of the project, its value is effectively increased. On the other hand, if you, as an investor, underestimate the uncertainties, you will be overestimating the value of the project. Finally, the right-hand plot shows how the AEP value changes with exceedance probability. *Watch out for: Make sure not to underestimate the uncertainties in the AEP calculation, otherwise you will be overestimating the value of the project. In this article, I have introduced you to the basics of Wind Resource Assessments. As an investor, there are a number of things to watch out for when assessing independent WRAs. This includes checking the assumptions of the uncertainty analysis well, making sure you discuss the results of any CFD simulations with a relevant independent expert and being aware how sensitive the wind speed measurements are to the project success.